We were hoodwinked, tricked, fooled! For a few days, the sun was shining, the temp warmed up, the crocuses were in bloom…I even convinced Evan, who’s 5 and very attached to things staying the same, that it was time to switch from the winter jacket to a nice springy fleece (not an easy task!). Then everything changed. Overnight it became damp, dreary, dark and SO cold again, and to top it all off, Skyler had her first track meet of the Spring season, outside, sitting on metal bleachers for hours! What else could I do, but make soup. Of course, it’s warmed up a bit in the last day or two, but this soup is yummy no matter what the weather outside is. 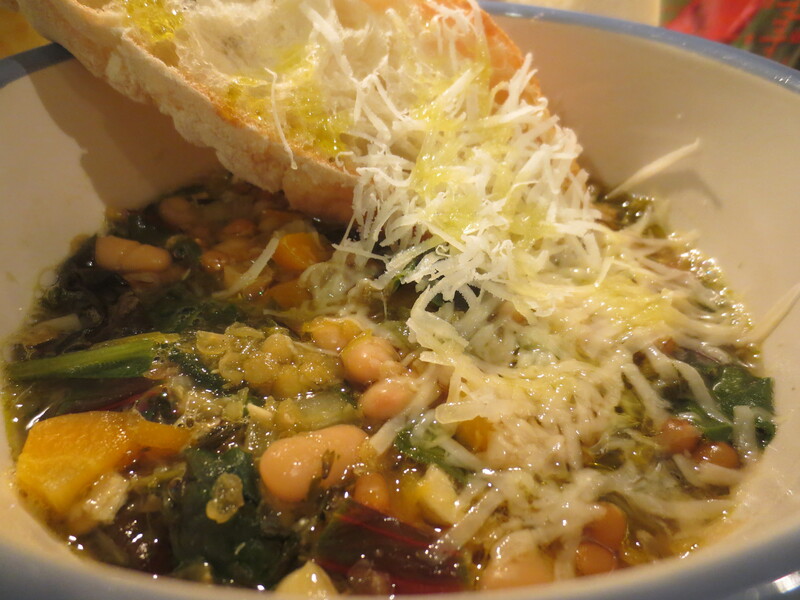 Here’s another version of one of our family favorites…beans and greens soup, warming and delicious. 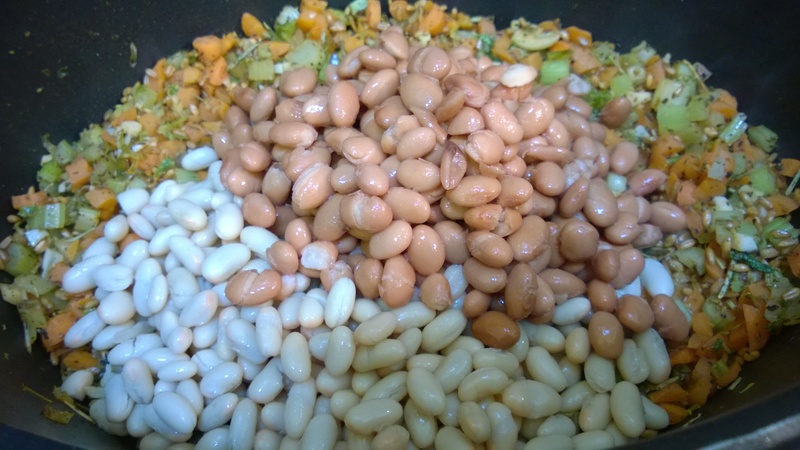 In this version, I’ve used a combination of white beans and pinto beans and a big pile of fresh chopped kale. 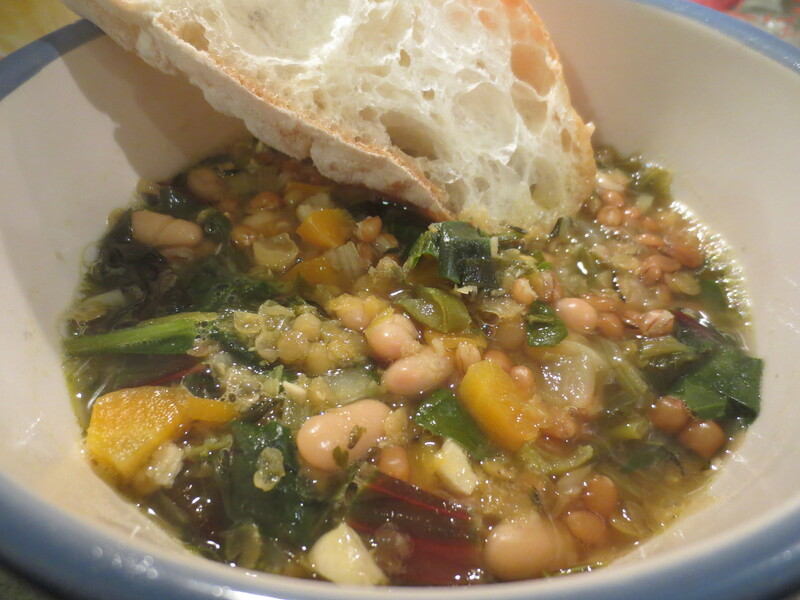 I also add in some wheat berries, which I adore in soups like this. The wheat berries cook up nice and al dente, holding up well as leftovers, unlike pasta which continues to absorb broth and turn to mush after a day or two in the fridge. The wheat berries do take a bit of time to cook though. When I have the time or for thought, I like to soak the wheat berries in a bowl of water for a few hours before draining and adding to the soup. Soaking the wheat berries, will speed up the cooking time and is said to aid in digestibility. 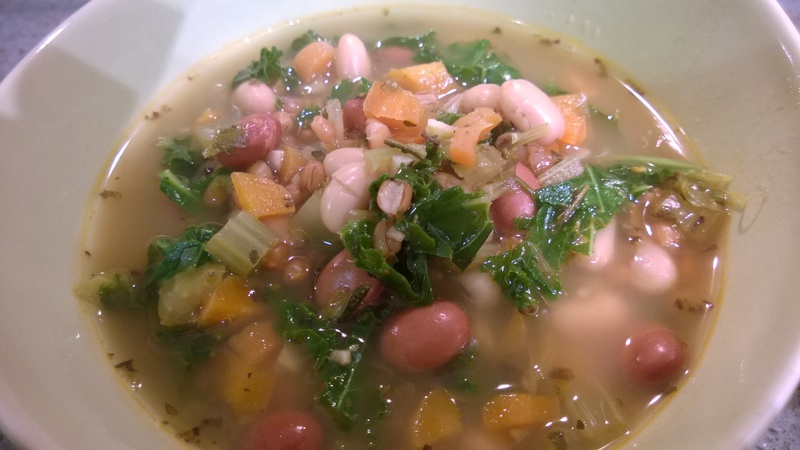 We’re well into soup season and I can’t believe it took me this long to share with you what I imagine to be the first of many versions of my favorite combo, that I share with you here; beans & greens! If it was up to Skyler, soup season would be everyday, all year, no matter the outside temperature, she just loves it and asks me to make it all the time. This soup is so versatile and can really be adapted to whatever beans you like and whatever greens you have on hand. 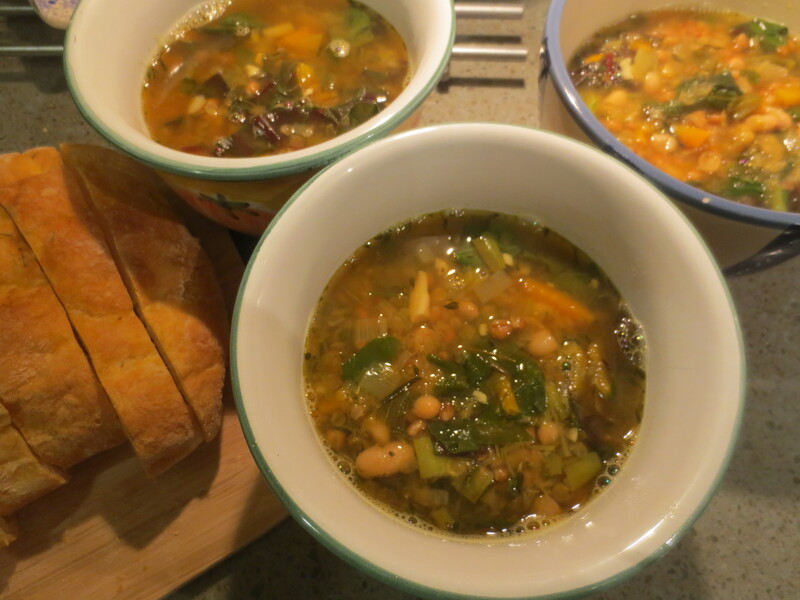 Beans and Greens Soup with red lentils, white beans, wheat berries and rainbow chard, yum! Very much like the Italian classic pasta fagoule, but instead of pasta I like to use wheat berries. The wheat berries cook up nice and al dente and hold up well as leftovers unlike pasta which continues to absorb the broth and can get a bit mushy. I also really like the way the red lentils melt into the broth while the white beans just soften a bit but still hold their integrity. 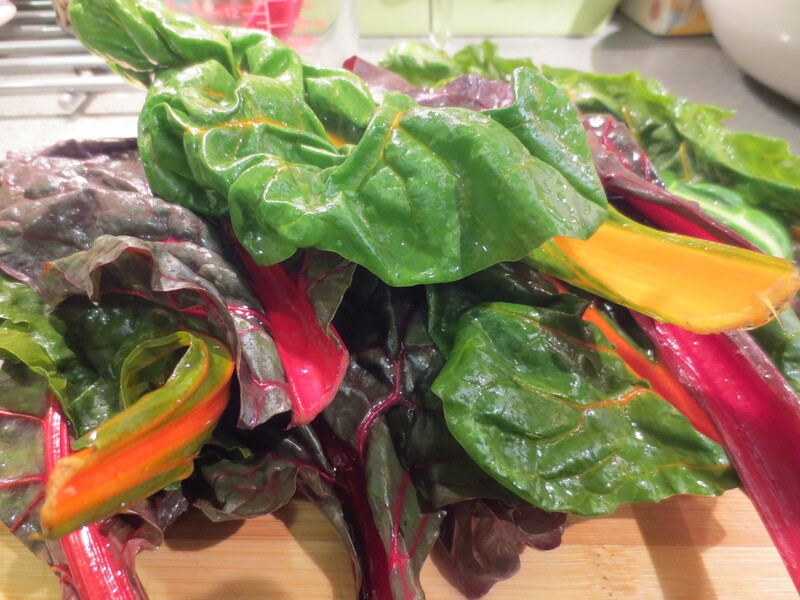 The soup is then finished with a big pile of chopped greens, in this case chopped Swiss or rainbow chard, stems and all. 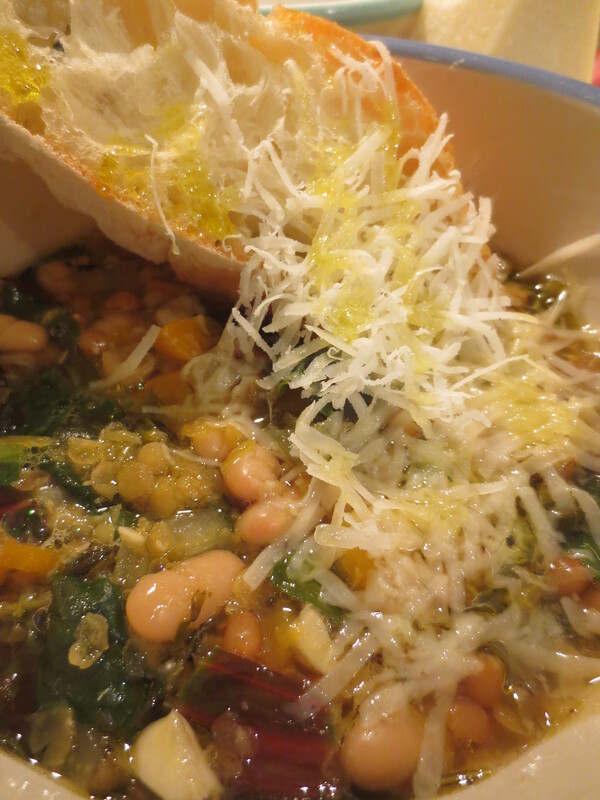 Lastly a drizzle of good olive oil, a sprinkling of grated cheese if you like, and a nice hunk of bread…soups on! Heat a large pot. Add a drizzle of olive oil to just cover the bottom of the pan. Add in the chopped leeks and cook over medium heat for a few minutes until softened. Next add in the garlic, celery and carrots. Cook a few more minutes and then toss in some thyme, rosemary and sea salt, plus the boullion cube if using, stir around to mix the herbs with the veges and break up the boullion cube. Add in the wheat berries and stir into the veggies and seasonings. Next add in the lentils and white beans then 6-8 cups of water. Partially cover and bring to a low boil, then fully cover, lower the heat to a simmer and allow to cook for 30 minutes to an hour or a few hours if you have the time. 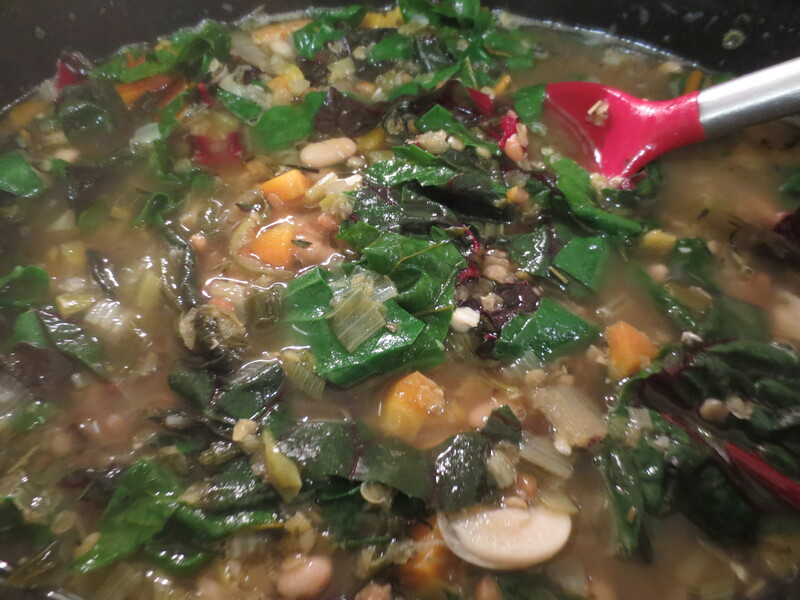 After the soup has cooked for awhile and the wheat berries are mostly cooked and the lentils have melted into the broth, add in the chopped Swiss chard and cook for another 10-20 minutes. Ladle the soup into individual bowls and top with grated Romano or Parmesan cheese if you like, plus an extra drizzle of olive oil. Serve with chunks of crusty fresh bread. Enjoy! 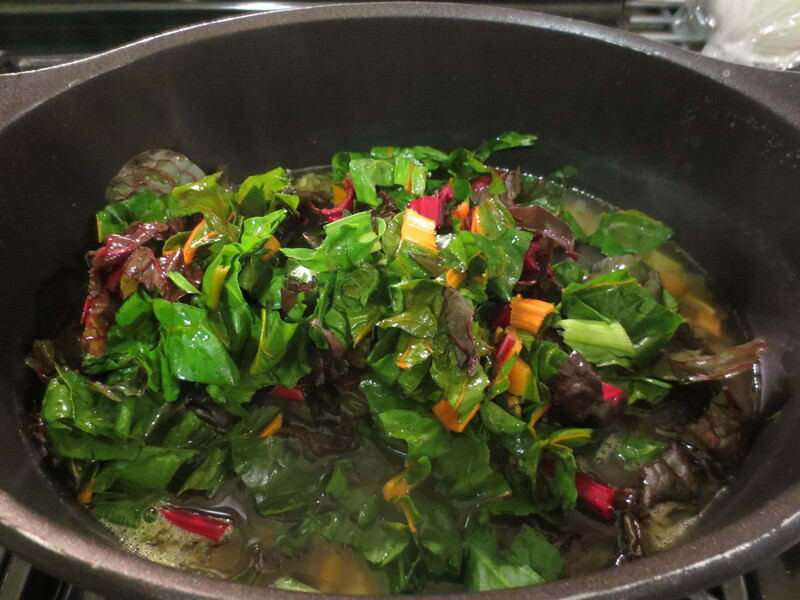 Recipe notes: This recipe makes a nice big pot of soup, easily serving 4-6 for a main dish. If your crowd is a bit smaller, don’t despair, make the full pot and stock your fridge with leftovers for the week. Leftovers make a great workday lunch or quick dinner on a busy night, just reheat and serve. This soup also freezes perfectly, just wait for it to cool down and then pour into individual freezer safe containers. If you have time, defrost for the day and then warm up in a small pot on the stove. If you forget to defrost, no worries, just run some luke warm water over the sealed container until it begins to soften a bit, add the partially thawed chunk of soup to a small pot and slowly rewarm over medium heat, stirring and breaking up the soup as you go. Wheat berries take awhile to cook, a good hour to one and a half hours. If you plan ahead, you can soak your wheat berries in a bowl of water overnight to speed up the cooking process. Otherwise, save this soup for a weekend or one of our many snow days!